Here is a list of frequently asked questions about the Night Sky Network and our website. How do I contact a club to do a presentation for my organization? Enter your zip code on Find Clubs to find to find a club near you. Click on the map icon, then on Club Information and use the displayed Club information to contact them. You can search for astronomy events in your community if you are curious about what different types of astronomy events are like! How do I find out about events held by astronomy clubs? Enter your zip code on the Find Events page to search for astronomy events near your community. Click on an individual event to find out more information. The Night Sky Network is a partnership of amateur astronomy clubs, NASA/JPL, and the Astronomical Society of the Pacific, and other organizations. For an overview, watch the videos on the About the Network page. The Night Sky Network was inaugurated and has been expanded to help meet these needs. 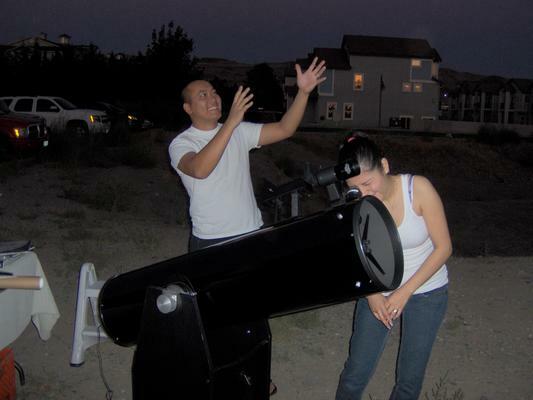 Amateur astronomers have an interest in providing the public with entertaining, engaging ways to learn basic astronomy concepts. It is one of the NASA education goals as well to improve the American public understanding of astronomy. The Night Sky Network has been developed and expanded with the dedicated assistance of advisory teams of amateur astronomers and industry experts. Why should my club apply for membership in the Night Sky Network (NSN)? Your club will join a national coalition of amateur astronomy clubs bringing astronomy and the excitement of NASA missions to your communities. Membership in the Night Sky Network is free. Click here for a full list of benefits. For more information on the benefits of membership, watch the videos on the About the Network page. Your club commits to using Night Sky Network resources in a minimum of five public astronomy events a year. Your club should be at least two years old, with a history of outreach in your community. Apply for membership using the online application form. We recommend that you review the contents of the online application form (pdf) before applying. But your continued enthusiasm with sharing your knowledge, time, and telescopes with the public is the primary qualification! Qualifying clubs must show a commitment to sharing astronomy with the public and an interest in contributing to the Night Sky Network community. How does my club submit an application? Only online applications will be accepted. You will need to designate two different members from your club as club contacts. Membership in the Night Sky Network is free. What happens when my club applies for membership? Your application will be acknowledged within a few days. Your application will then be reviewed and your club contacts will be notified within two to four weeks of your club membership status. What happens when my club is accepted for membership? Your club and its members will then be eligible for all the benefits of membership in the Night Sky Network. Your primary point of contact for your club will be your Night Sky Network (NSN) Club Coordinators. Your club may download a special Night Sky Network logo and link to post on your website designating your club as a member of the Night Sky Network. You have the right to use this logo on your website, club correspondence, and publicity. Your club is listed as a member on the Night Sky Network. Your club's officer and the Night Sky Network club coordinator listed on the application form are each sent an email witht heir login and password for the Night Sky Network.The club coordinator can begin regsistration of other club members as participants in the Night Sky Network. Your club will become eligible to receive your first toolkit after logging two public astronomy events using Night Sky Network Astronomy Activities and resources. Details will be sent to your club coordinators. We recommend you place the Night Sky Network login page into your favorites or bookmark the page in your browser. What does my Club Coordinator do? Your club needs to assign at least one primary and one backup club coordinator. In case the primary club coordinator is unavailable, the backup can take over. The primary and backup club coordinators are the club contacts you put on your application for membership. The club coordinators can change who is designated for the role after your club is accepted into the program. Maintain the roster of your club members who are participants in the Night Sky Network. Maintain your NSN Club Home page. How does my club maintain its membership in the Night Sky Network? To receive continued support for this program, NASA must document the success of the Night Sky Network. This is accomplished through by reporting club events va the NSN website's logging system. To remain a member in good standing of the Night Sky Network, your club agrees to log a minimum of five outreach events per year using outreach toolkits and other NASA/Night Sky Network resources. These are referred to as NSN Events. Timely and accurate logging of outreach activities and events into the Night Sky Network (NSN) is essential. A NSN Club that continues to log at least two NSN events per calendar quarter will be eligible to receive additional outreach toolkits and to participate in all activities provided by the Night Sky Network. Outreach is any activity that involves sharing astronomy with your community, with youth groups, or with your astronomy club members. A gathering at your house where you take a group of friends outside to look at the sky. An NSN event can even be an article you write for a club newsletter or local newspaper or a spot on a local radio or TV show about an outreach toolkit, about the NASA missions featured in the toolkit, or about the Night Sky Network program. Each Outreach Toolkit includes the materials you need to support a variety of activities, as well as a training video on DVD showing ways you might use the materials, a manual of suggested activities, PowerPoint presentations, and video clips. Click here for an example of activities found in the NSN Outreach Toolkits. As long as you continue to log events using the toolkits and other Night Sky Network Resources, your club is eligible to receive NSN toolkits. PlanetQuest Outreach ToolKit: The search for planets around other stars. Our Galaxy, Our Universe Outreach ToolKit: Scale and distance in our Solar System, galaxy, and universe. Black Hole Survival ToolKit: Gravity and black holes. Telescopes: Eyes on the Universe : How telescopes work and helpful answers for common questions heard at the eyepiece. Shadows & Silhouettes: Phases, eclipses, transits, and the science of NASA's Kepler Mission. Exploring the Solar System; The sizes distances of the planets explored, along with highlights of NASA's Solar System Exploration Missions. SUPERNOVA! ; The lives of stars, cosmic radiation, and the role of supernovae in the universe. What is available on the Night Sky Network website? For the best overview, watch the videos on About the Network. Click here for the full list of NSN membership benefits. For the public to find out about events you and other astronomy clubs are holding, to share these events with others, and to contact your astronomy club. Include your club logo and club locations on your NSN Club Information page, such as where you hold club meetings and have public astronomy events. Who sponsors the Night Sky Network? The Night Sky Network is sponsored and supported by NASA/JPL, and the program is managed by the Astronomical Society of the Pacific Various NASA missions and projects have provided support to the outreach efforts of NSN membvrs throughout its history. I am not a member of an astronomy club. How can I join one near me? If you are not a member of an amateur astronomy club and want to become involved, use Find Clubs to find the nearest club that is a member of the Night Sky Network. Use the displayed club contact information to find out how to join. You can also search for astronomy events in your community if you are curious but do not yet want to join a club. You can also search for and download a variety of astronomy activities for use with the public in your own outreach. Contact us through this online form or click on "Contact" below.